The Erie Railroad operated trains across the viaduct from 1882 until 1959. After 28 years of inactivity, the Knox and Kane Railroad offered excursion passenger trains from Marienville (48 miles to the South by rail) to and across the bridge starting in 1987. These steam driven trains continued until 2002 and were the last trains to ever cross the bridge. The bridge stood for 121 years before partially collapsing under the powerful winds of a tornado in 2003. In 2009, work started to reinvent the remaining towers of the historic viaduct as a pedestrian walkway. That plan was changed. 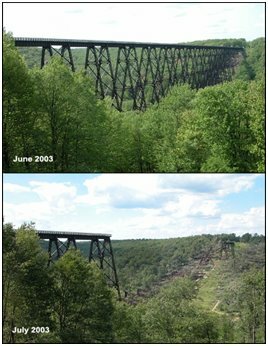 Today the Viaduct has been reinvented as the Kinzua Sky Walk — a spectacular walkway that once again allows the public to “Walk the Tracks Across the Sky.” A partial glass-bottomed observation deck enables visitors to look down at the remaining towers supporting the historic structure. 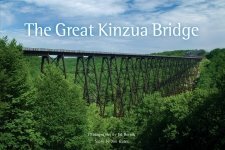 The Kinzua Bridge State Park features lovely picnic areas, hiking trails, interpretive programs, group tent camping and scenic overlooks. A park pavilion may be rented for special events. In the language of the Seneca-Iroquois, “Kinzua” is written as, Tgëhjowa (tgenh-joh-wawh! ), which translates as “fish on a spear”. Order Tracks Across the Sky – award winning documentary on the history of the viaduct up to the tornado of 2003.